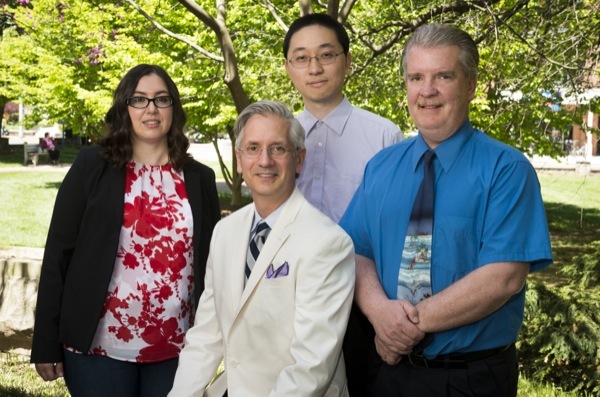 Excellence in Teaching Award winners (from left) Michal Herzenstein, Thomas Becker, Juejun Hu and Gary Allison. 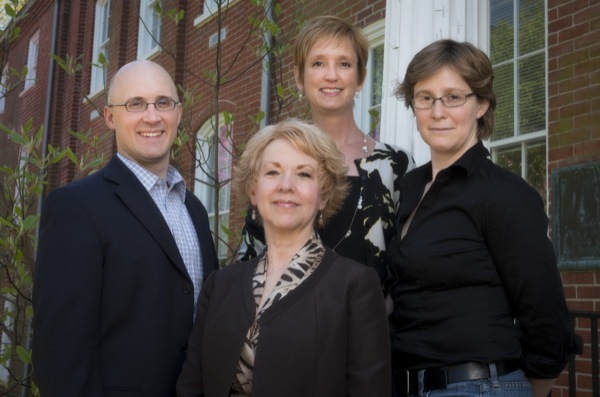 Excellence in Faculty Advising and Mentoring Award winners (from left) Eric Furst, Marsha Baumeister, Jennifer Gregan-Paxton and Jennifer Buckley. 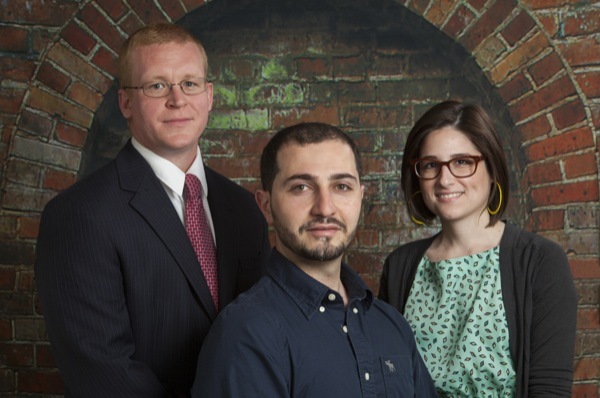 Excellence in Graduate Teaching Award winners (from left) Joseph Turner, Furkan Cayci and Tiffany Racco. 4:01 p.m., May 6, 2013--Eight members of the University of Delaware faculty have been recognized for outstanding work in teaching and advising, and three graduate teaching assistants have received awards for excellence in teaching. The Excellence in Teaching and Excellence in Undergraduate Advising and Mentoring awards were presented at the May 6 meeting of the Faculty Senate. Excellence in Teaching Awards are based primarily on nominations from current and past students. Each winner receives $5,000, has his or her portrait hung in Morris Library for five years and has a brick, inscribed with his or her name, installed in Mentors' Circle, between Hullihen Hall and the Morris Library. This year's Excellence in Teaching Awards were presented to Gary Allison, assistant professor of special education; Thomas Becker, professor of management and chair of the Department of Business Administration; Michal Herzenstein, assistant professor of marketing; and Juejun Hu, assistant professor of materials science. UD's Excellence in Advising and Mentoring Award is based on student nominations, and recipients each receive $2,500 and are honored with an inscribed brick in Mentors' Circle. Honored this year were Marsha Baumeister, assistant professor of education; Jennifer Buckley, assistant professor of mechanical engineering; Eric Furst, professor of chemical and biomolecular engineering; and Jennifer Gregan-Paxton, associate professor of marketing and senior academic adviser. Each recipient of the graduate student Excellence in Teaching Awards receives $1,500. This year's honorees are Tiffany Racco, an art history doctoral student from Meriden, Conn., specializing in Italian Baroque art; Furkan Cayci, a doctoral student in electrical and computer engineering from Istanbul, Turkey, whose research examines embedded systems, power analysis and hardware technology; and Joseph Turner, a Ph.D. candidate in the Department of English from Baltimore, whose dissertation explores medieval literary and rhetorical traditions. UDaily asked this year's honorees to share their thoughts about teaching and advising. Excerpts from their responses are printed below. To read the complete responses (PDF) of several of the honorees, click on their names. Joseph Turner: "My pedagogical focus is always on students' writing. Equipping students with strong writing skill can help them long after they leave UD. An education is about learning to reason through complex ideas, and I want my students to see writing as a tool for understanding difficult material."